Now is your chance to be a part of a winning team of dedicated employees who love what they do. Helping RV customers reach their RV travel dreams is our goal. 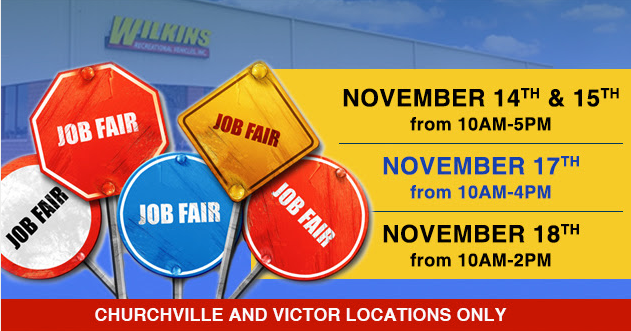 If you have what it takes to be employed in the RV industry, join us at our RV Job Fair November 14th-18th! We offer a generous pay plan, health, dental, life and disability insurance, 401(k), paid vacation, professional working environment, job specific training and advancement opportunities. EOE. Wilkins RV is a leader in the RV industry. As a Top 50 Dealer in the United States, we strive to provide the best sales and service experience to our customers. We have maintained an “A” rating with the Better Business Bureau since 2004. This is a good indication of the commitment we put into our company. We have been in business for 80 years over three generations. Because of our longevity, we are a trusted name that customers rely on to fill their RV needs. Make sure you bring a current resume and be ready to fill out an application or fill out an online application ahead of time. 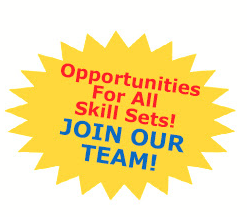 Contact Us if you have any questions about available job openings. We look forward to meeting you!